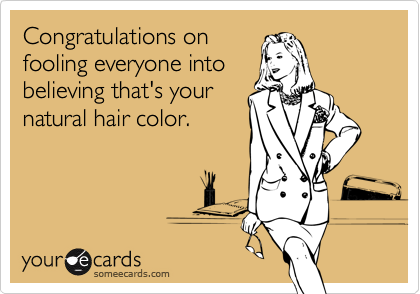 Me: "Thanks for not noticing my lighter hair color yesterday or this morning..."
Him: "I did notice the $75 bill though." Me: "Of course you did." Him: "I was probably busy looking at your chest." Maybe not noticing is better than your 12 year old fashion expert ridiculing you. Maybe? It looks great. And how could they not notice? I love the color! It looks great on you.